The Danes are thrilled after the victory in the 1st Schleswig War. Danish politicians now dream of incorporate Schleswig to the Kingdom of Denmark, in defiance of the peace agreement. In a small community, the brothers Peter (Jens SÃ¦tter-Lassen) and Laust (Jakob Oftebro) grow up, and both fall in love with Inge (Marie Tourell SÃ¸derberg). When the Danish President of the Council of Ministers, Mr. Monrad (Nicolas Bro), claims that Schleswig must be incorporated to the Kingdom, everyone is aware that it is the start of 2nd Schleswig War. But only this time, the Danish troops are met by Otto von Bismarck's (Rainer Bock) Prussian and Austrian army. An army much bigger and stronger than the Danish. 150 years later the maladjusted teenage girl, Claudia (Sarah-Sofie Boussnina) is on the edge of a meltdown and is forced to be visit friend to the old Baron, Severin (Bent Mejding). Inges old dairy catches Claudias interest, and through Inges writings, Claudia experience thousands of young Danes, sacrificing their lives in the Battle at Dybboel, 1864, for a meaningless and incomprehensible war. This is the story of one of the greatest defeats of Danish history in the middle of a period of blooming patriotism. 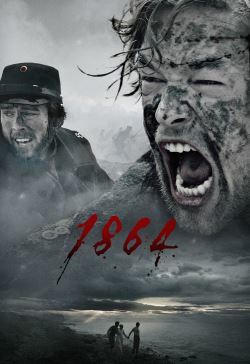 1864 is the story about innocence and love, ignorance and rashness.